Margaret Harmon is a modern fabulist (someone who writes fables) and humorist. Fables from The Man Who Learned to Walk In Shoes That Pinch: Contemporary Fables and The Genie Who Had Wishes of His Own: 21st-century Fables aired on National Public Radio and are taught in literature and oral interpretation classes. Ray Bradbury described her fables as “Fantastic!” In A Field Guide to North American Birders: A Parody, birders discover their own species. 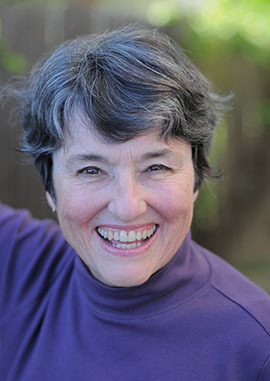 Over 300 of her essays, features, humor, and Op-Eds have appeared in national publications. Awards include “Best of the Best San Diego Writers” on NPR. She and her husband live in San Diego, California. Find her on her website. If you haven’t read her story, Brightlook!, take the time to do so before reading on. It is a powerful piece of writing. WOW: I have to tell you, I found Brightlook! unsettling and powerful. What was your inspiration for this piece? Margaret: Prepping to teach a Flash Fiction Writing Workshop, I wrote some pieces for fun. I’d recently learned that the brain functions for several minutes after the heart stops, and I’m always fascinated by imagining solutions for human problems. WOW: Ah, I do that too. I’ll read something or hear something and there goes my brain, spinning a scenario. Can you share your writing process with us? How did Brightlook! change from initial idea to submitted story? Margaret: I wake up with my new ideas—to jot immediately. I love writing rough drafts and researching. After I polish a piece, my husband reads it and gives feedback. Polish again. Then my trusted Writers’ Network colleagues critique it. I keep polishing and getting feedback until the new piece works. “BrightLook!” grew tighter and clearer; it always wanted to be dialog. Researching the exorbitant costs for incarceration and executions intensified my interest in the story. WOW: How did you decide what details belonged in the story? For example, why did you not tell the reader what crime Ben committed? Or which path he chose? Margaret: Ben is the character who takes us into BrightLook! so we need to identify with him. He can’t be a serial killer selling body parts to China. Ben is yearning and scared, a fundamentally nice young person who’s in trouble. He’s polite to Dr. Thorne, so terrified of the EX Track that he tries not to touch its book. We each picture our own Ben. His brother was a petty criminal—and we see Dr. Thorne help Ben start changing his life by cutting off talk about old, failed prisons. Telling Ben that people who started life in dysfunctional families, schools, and neighborhoods can use Restart to build a new life, Dr. Thorne suggests how Ben probably got in trouble and which path he will choose. WOW: Your biography says that you are a “fabulist” which is such an awesome way to say you write fables. Can you share with our readers what makes a piece a fable vs simply a short story? Margaret: A fable is fiction that explores a life strategy by creating a character who lives by that strategy 100% so we see the consequences. If her strategy is flawed, she suffers. We call that a Cautionary Tale and thank her for warning us. If the strategy is good, the character succeeds—and we might put her on our shoulder to inspire us. Fables are psychological power tools we use to become who we want to be—personally, in relationships, and as a society. But we each reread and embrace only the fables that address the behaviors we are trying to quit or develop. Humans have been writing fables for 3,000 years in nearly every culture because our brains are wired to Listen to a Lecture, but Live a Story. We identify with a character and experience a story through our own five senses—and remember and believe. We can learn about a culture by reading its fables. And instead of nagging a child to change a behavior, we can read her a fable about what happens to someone with that behavior. WOW: That makes perfect sense. Now I get it. You have written a variety of work from novels to fables. What advice do you have for readers who are still trying to decide what form is a good fit for them? Margaret: What do you read most? Who are your favorite authors? What do you do BEST—short, long, funny, inspiring, suspense, nonfiction? What do readers like from you and what do they reject—and why? Can you fix what they reject, or should you move to another form? Find honest, perceptive beta readers—and give them chocolate. Read your work aloud at open mics to see where people laugh, lean forward, or fall asleep. Write for YOU and YOUR READERS, not the market, because the market changes so fast that by the time you master the current hot thing and get your work to agents, it will no longer be hot. Trust yourself: I wrote poetry, humor, and novels for years—until I wrote a fable at a writers’ conference. Fables use The Whole Essence of the Protagonist (novel), each word must feel good in your mouth as well as your brain (poetry), and it must be short and tight (humor). Grow and have adventures. You’ll recognize yourself when you see you. WOW: Thank you so much for sharing your ideas on writing with us. I don’t know about our other readers, but I find myself playing with ideas for writing a fable. I’m partial to tricksters. Thank you for everything you have shared! Sue--Thanks for doing this interview. I agree with you. Margaret's story was unsettling. Margaret--I bow down to you--a fabulist--and to writers like Sue who simply have to meet a fabulist and already they're thinking of ideas for their own fables. Your husband reads your stuff? You are quite fortunate. Not all spouses of writers what we do.